Read for This Week's Study: Rom. 7:1-6; 8:5-8; Rom. 7:7-13; Rom. 4:15; Acts 13:38-39; Gal. 3:10. Memory Text: In the same way, my friends, you have died to the law through the body of Christ, so that you may belong to another, to him who has been raised from the dead in order that we may bear fruit for God (Romans 7:4, NRSV). A woman is driving way over the speed limit. Suddenly, she sees in her rearview mirror the flashing red and blue lights of a police car and hears the familiar wail of the siren. She pulls over, grabs her purse, and takes out her driver's license. The policeman approaches, takes her license, and returns to his car. She wonders how much the ticket is going to be (she was way over the limit); she also worries about how she will be able to pay it. A few minutes later the policeman comes back and says, OK, Miss, what we are going to do, so that you don't have to face the penalty of the law again, is abolish the law. You no longer have to worry about the speed limit. As ludicrous as that story is, it's no more so than the theology that teaches that after Jesus died, the law, the Ten Commandments, was abolished. This week we'll look at the death of Jesus and what it means in relation to the law. *Study this week's lesson to prepare for Sabbath, May 10. Carefully examine Romans 7:1-6 and summarize as well as you can what Paul is saying. Read it carefully, keeping in mind other Bible passages about the law. Although some Bible versions incorrectly translate verse one to read that the law is binding until death, a literal interpretation is: every living person is under the rule of law. The emphasis is not on the dead but on the living. The example from marriage demonstrates that any married person who has an intimate relationship with someone other than his or her spouse has broken the law and is guilty of adultery. Only if his or her spouse dies can he or she enter a relationship with another person without violating the law. Also, some argue that this passage shows the death of the law; however, it really shows a person's death to the law through the body of Christ (Rom. 7:4). According to Romans 6:6, the part of the person that dies is the old self. When united to the old self, the person is condemned by the law and thus trapped in a miserable relationship (Rom. 7:9-11, 24). After the old self dies, the person is free to enter into a relationship with another-the resurrected Christ (Rom. 7:4). What Paul is saying is that because law binds every living person, God's law must also govern the new union. However, the fact that the believer is now married to Christ means that the law is no longer an instrument of condemnation; the believer in Jesus is free from the condemnation of the law because he is covered in the righteousness of Jesus. Paul is not stating that the Ten Commandments, which define sin, are now abolished; that would be contrary to so much of the Bible, his own writings included. Instead, he is talking about a new relationship one has to the law through faith in Jesus. The law still is binding; it's just that for the believer in Jesus, the one who died to self and to sin, the law no longer holds him or her in the grip of condemnation because they now belong to another, Jesus. Paul assures the Christian that there is therefore now no condemnation to those who are in Christ Jesus. . . For the law of the Spirit of life in Christ Jesus has made me free from the law of sin and death (Rom. 8:1-2, NKJV). If we read these verses apart from their immediate context, it would appear that Paul was referring to two opposing laws: the law of life and the law of sin and death. However, the difference is not with the law but with the individual before and after he or she receives Christ. In what ways does Paul's discussion in Romans 7:7-13 illustrate the role of the law? The function of the law depends on the person with whom it is associated. The same knife, for instance, can be used by a surgeon to heal or by a murderer to kill. In the same way, a thief who breaks a law to steal someone's purse will stand in a different relationship to the law than will the one whom the law was meant to protect (the owner of the purse). The law itself may sometimes be described as holy and righteous and good (Rom. 7:12, NASB), or as the law of sin and of death (Rom. 8:2, NASB). However, in the same way that God's retributive vengeance does not stop Him from being a God of love, the law's function as an agent of sin and death does not make it sinful. According to Romans 8:5-8, the law is an instrument of sin and death for those who set their minds on the things of the flesh (Rom. 8:5, NASB). This describes the person who is still married to the old self and has no apparent desire to sever the relationship and be joined to the resurrected Christ. As a result of the sinful union, the person finds himself at enmity with God and His law since they are on opposing sides (Rom. 8:7). Paul then emphasizes that it is impossible for the mind set on the flesh to submit to God's law, or even to please Him (Rom. 8:7-8, NASB). This is obviously not a reference to the struggling individual of Romans 7:13-25, since that person serves the law of God with my mind (Rom. 7:25, NASB). Paul is probably referring to those who by their wickedness suppress the truth (Rom. 1:18, NASB). It is for these rebels against God's sovereignty that the law becomes an instrument of sin and death (Rom. 2:12). How do you relate to the law when you violate it? According to Romans 4:15, 5:13, and 7:7, what is the function of the law? Also, what does Romans 7:8-11 say about the effect that the law has on the person who violates it? Every instrument has its purpose. Just as a key is used for opening a lock or a knife is used for cutting, so the law is used to define sin. Had it not been for God's law, there would be no absolute method of knowing what actions were acceptable or unacceptable to Him. And though sin cannot exist without the law, Paul makes it clear that the law is not a willing partner with sin: Did what is good, then, bring death to me? By no means! It was sin, working death in me through what is good, in order that sin might be shown to be sin, and through the commandment might become sinful beyond measure (Rom. 7:13, NRSV). In what ways do the above texts help to shed light on 1 Corinthians 15:54-58? If read in isolation, 1 Corinthians 15:54-58 would appear to promote a negative view of God's law. Paul's point, however, is that the law empowers sin only because it defines what sin is. And, of course, the wages of sin is death (Rom. 6:23). Had it not been for the law, there would be no death because it would be impossible to define sin. In 1 Corinthians 15 , Paul's purpose is not to demonize the law but to demonstrate how, through the death and resurrection of Jesus, all who believe can experience victory over death, a death which comes because of violation of the law. When was the last time that someone sinned against you, that is, the last time that someone violated God's law in a way that hurt you? How does such an experience help us to understand why the idea that states that God's law was abolished after the Cross is so wrong? Though in one sense, as we saw, the law empowers sin, in another real way the law is terribly impotent. How can the same object be both powerful and impotent at the same time? Here again, the difference lies not in the law but in the person. For the one who discovers that he is a sinner, the law forces him to acknowledge that he is going against God's will and is consequently on a path to death. Upon discovering his sinfulness, the sinner may decide to follow the law to the letter. However, the fact that he has already sinned has made him a candidate for death. Read Acts 13:38-39, Romans 8:3, and Galatians 3:21. What do they tell us about the law and salvation? Some people believe that strict adherence to the law will grant salvation, but this is not a biblical teaching. The law defines sin (Rom. 7:7); it does not forgive it (Gal. 2:21). Hence, Paul remarks that the same law that empowers sin is also weak (Rom. 8:3). It is able to convict the sinner of sins but cannot make the sinner righteous. A mirror can show us our faults; it just can't fix them. As Ellen G. White wrote: The law cannot save those whom it condemns; it cannot rescue the perishing. -The Signs of the Times, November 10, 1890. When we fully consider the purpose of the law, it is easier to understand why Jesus became the atoning sacrifice for the human race. The death of Jesus placed formerly sinful human beings in a right relationship with God and with His holy and righteous and good law (Rom. 7:12, NASB). At the same time, too, His death showed us the futility of salvation by keeping the law. After all, if obedience to the law could save us, Jesus would not have had to die in our place. The fact that He did reveals that obedience to the law could not save us. We needed something much more drastic. Though we are promised again and again the power to obey God's law, why is this obedience not enough to secure our salvation? In one sense the answer shouldn't be that difficult. Look at yourself and your law-keeping. If your salvation depended upon your obedience, how much hope would you have? What do the following texts tell us about human nature? How do we see the reality of this truth every day? Ps. 51:5, Isa. 64:6, and Rom. 3:23. With the exception of Christ, all human beings have a common experience in that all have been infected by Adam's sin. Consequently, no natural person can ever claim to be fully righteous. There are some such as Elijah and Enoch who lived exceptionally close to God, but none has been able to live completely blameless. Indeed, it is with this reality in mind that Paul declares: For all who rely on the works of the law are under a curse; for it is written, Cursed is everyone who does not observe and obey all the things written in the book of the law (Gal. 3:10, NRSV). The truth is, the law demands total and complete conformity, and who has ever always given that, except Jesus? How does Romans 6:23 help to define what the curse of the law means? See also Gen. 2:17 and Ezek. 18:4. Everyone is naturally under the curse of the law. Because the law has no margin for error, it is impossible for a person to correct a past sin. Consequently, death is the individual's fate. James paints an even bleaker picture by reminding us that transgression in one area of the law is just as bad as transgression in all areas (James 2:10). The wages of sin is death, and death has no proportions. When we recognize the helpless condition of those under the curse, it is easier to appreciate the extent of God's love: But God demonstrates His own love toward us, in that while we were still sinners, Christ died for us (Rom. 5:8, NKJV). Through His death, Christ redeemed us from the curse of the law by becoming a curse for us (Gal. 3:13, NIV). Think about what Paul said: For all who rely on works of the law are under a curse (Gal. 3:10, RSV). This is because the law can't save us; thus, we are cursed with death. How can acknowledging this truth help us to better appreciate what we have been given in Jesus? In what ways do we manifest such appreciation in our lives? See 1 John 5:3. Further Study: Ellen G. White, It Is Finished, pp. 758-764, in The Desire of Ages. The law requires righteousness,-a righteous life, a perfect character; and this man has not to give. He cannot meet the claims of God's holy law. But Christ, coming to the earth as man, lived a holy life, and developed a perfect character. These He offers as a free gift to all who will receive them. His life stands for the life of men. Thus they have remission of sins that are past, through the forbearance of God. More than this, Christ imbues men with the attributes of God. He builds up the human character after the similitude of the divine character, a goodly fabric of spiritual strength and beauty. Thus the very righteousness of the law is fulfilled in the believer in Christ. God can be just, and the justifier of him which believeth in Jesus. Rom. 3:26.-Ellen G. White, The Desire of Ages, p. 762. In summary, the death of Jesus powerfully demonstrated the permanence of God's law. When our first parents sinned, God could have abolished His laws and taken away the penalties for violation. However, this would have meant a miserable existence in a lawless society for the earth's inhabitants. Instead, God chose to send His Son as a Substitute for us, in that He received the just penalty for sin as required by the law on behalf of all people. Through Jesus' death, the entire race stands in a new relationship to God. This means that any one of us, through faith in Jesus, can have our sins forgiven and stand perfect in God's sight. Many religions teach that at the end of a person's life God balances the persons' good deeds against the bad deeds before determining whether that person will be rewarded in the afterlife. What is so terribly wrong with this kind of thinking? Jesus, the One who was equal to God, died for our sins. If we think that obedience to the law can somehow add to that, in terms of saving us, what does this say about the efficacy of Christ's sacrifice? What are some other reasons why the idea that states that God's law was abolished after the Cross is false? When people say that, what do they really mean was abolished; that is, what commandment do they think was abolished? Ten-year-old Moses stared out the airplane window at the large city below. This would be his new home. What will it be like to live in the United States? Moses wondered. Will I make friends here? Will I even be able to talk to them? For as long as Moses could remember, his family had lived in one refugee camp after another in central Africa. His home had been a plastic tarp held up by sticks. When it rained, everything got wet, and there seldom was enough food to eat or clean water to drink. One day Moses' father told the family, "Soon we will leave this camp for a new home in the United States." The family arrived in their new home and settled into an apartment. On the first day of school Moses felt lost. He couldn't find his class and couldn't speak English to ask for help. Finally someone took him to his class. Moses studied hard and soon could speak enough English to talk to his classmates. He began telling his new friends that Jesus loves them. Some listened, but others ignored him. Father and Mother studied English so they could find work. Everything seemed so hard. They struggled to find a grocery store and a church. Riding the bus was difficult until they could speak the language. After months of studying and searching for work, Father found a job. Then one day Moses' father stumbled into the apartment, blood spattered on his face and clothes. "Some teenagers don't want us here," he said. "One of them hit me with a rock." Father lost his eyesight in the injured eye. But he refused to be angry. "We can't be angry when someone hurts us. We must forgive them and pray for them." Moses knew that his father was right, but it was still hard to forgive the teens who had hurt his father. The family has found a different place to live, and church members are helping to pay the children's tuition so they can study in the Adventist school. Moses wants to be a pastor, as his grandfather in Africa was. He shares God's love with others and offers to study the Bible with them so they will learn to love God too. "God has been with my family through hard times," he says. "He will never leave us." A recent Thirteenth Sabbath Offering is helping to reach millions of refugees in North America with the message of God's love. Thank you for reaching out to the world by reaching the world in in North America. 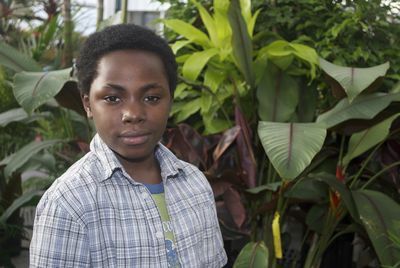 Moses Ntekereze shares God's love in the northern United States with his parents and siblings.